that this unit was in charge of the POW camp at Rabaul. Status: offline The GAME has placed those extra units on Guadalcanal in order to make the scenario more of a contest. It has the same historical justification as placing the Prince of Wales and Repulse out in the Gulf of Siam on the 1st turn of the Grand Campaign so that the same bombers that bombed Singapore during the night phase can (well only 8 out 10 times or so) sink them during the day phase (with a torpedo attack in both phases no less). Elements of Kure 3rd SNLF supplied the original Tulagi garrison in May and then additionally for Guadalcanal in June '42. Further elements of 3rd SNLF as well as 81st Guard Unit troops and specialist units from Rabaul's 8th Base Force followed in July, being grouped administratively under the HQ of 81st Guard Unit. The 81st was then ordered in Aug to return to Rabaul, handing over control of the local garrison to the HQ of the 84th Guard Unit. The HQ and lead elements of the 81st reached Rabaul just as the US began their invasion landings. Although the Guard Units contained some combat elements, their main function tended to be as administrative and service troops. On Guadalcanal and Tulagi, most of the fighting power for the garrison at the time of the US invasion still came from those elements originally allocated to the Guard Units from 3rd SNLF, which is why the SNLF troops tend to be mentioned in accounts covering the initial fighting. Sounds like the Japanese were pulling out troops to send to Buna to march to Port Moresby. The first reaction troops to the US landings involved the battalion sized "Ichiki Detachment". Do you know what unit they came from? Status: offline The Ichiki Detachment was the 2nd Battalion, 28th Infantry Regiment with some added artillery and engineers. Its strength was 917 men. The Ichiki Detachment was named after its commander, Colonel Kiyonao Ichiki. He commanded the 28th Infantry Regiment, which was originally part of the 7th Division based on Hokkaido. The 28th Infantry Regiment was intended to capture Midway; after the severe naval defeat at the Battle of Midway, they were rerouted to Truk. After the 1st Marines landed at Guadalcanal, the Ichiki Detachment was landed by six Japanese destroyers at Taivu Point with orders to retake Henderson Field. The bulk of the 81st Guard Unit weren't sent to Guadalcanal. It's main role was in support and security of the naval facilities for the Rabaul area, including the running of local POW camps as the OP mentioned. The detachment of the 81st sent to Guadalcanal in July was to oversee the administration and security of the new base being built on Lunga until a specific guard unit (the 84th) could be organised to take over. The return of the 81st detachment to Rabaul in early August was primarily because it had by then completed the hand over to the 84th. Most likely the 81st detachment just returned to rejoin its parent unit for further duties on Rabaul. There already were existing naval Guard Units responsible for the navy controlled areas in Lae and Buna, so I doubt the 81st detachment would have been needed there. There was however the upcoming Rabi (Milne Bay) operation tentatively planned for August, so it's possible the 81st was planning to send a detachment there to oversee the initial establishment of the new base, assuming it was captured of course. Just in relation to the 81st detachment on Guadalcanal from Jul-Aug, it was reportedly less than 60 men, reinforced by two platoons (about 100 men) from the Kure 3rd SNLF before it sailed from Rabaul in late June to absorb the other SNLF platoons already garrisoning the Lunga area on Guadalcanal. Most of the SNLF platoons remained behind when the 81st detachment left in early August. I doubt the US Marines would have noticed any difference had the 81st stayed as well. As for Cheeky Ichiki, all I can add in addition to what Hrafnagud mentioned is that the Ichiki Detachment was not originally part of the 17th Army (tasked then with New Guinea operations only) but had just completed a period of occupation duty on Guam and sailed on Aug 7th for Japan, likely to rejoin the detachment's parent 7th Division on Hokkaido. After news came through of the US landing on Guadalcanal, the detachment was ordered instead to Truk and became an emergency add-on to the OOB of the 17th Army. The only existing 17th Army combat units available at that time to deal with the sudden crisis were the Kawaguchi and Aoba detachments but they were on Palau and Mindanao and would've arrived too late to stop the US completing the partially constructed airfield on Lunga. So Ichiki got first crack, leading in the roughly 900 strong first echelon of his force via destroyer transport while leaving behind his 1400 strong second echelon to follow with his supplies on slower transports from Truk. Status: offline Near as can be determined, the early garrison of the Solomons comprised 3rd company of the Kure 3rd SNLF augmented by 1st platoon of 1st company and 1st platoon of 2nd company. The Mitsuwa AA Buntai was from 4th Base Force, by way of Palau, and was a Fleet unit supporting Yokohama Air Group, at Gavutu, and not part of the SNLF or Guard establishment. Elements of the 81st Guard Unit (Lt Yukio Endo)deployed to Lunga in order to assist in establishing the airfield. These included parts of the 85th Commo Unit (21) and 4th Meteorological Unit (7) augmented by a (combined) gun platoon and AA platoon from Weapons Company, Kure 3rd. Endo’s command (designated RXI Guard Force, 81st Guard Unit) departed Lunga for Rabaul, 2 August, leaving behind the Combined Gun Platoon under WO Tetsuzo Nakamura to augment the newly formed 84th Guard Unit. The 84th Guard Unit (Cmdr Masaaki Suzuki), was formed 1 July from elements of Kure 3rd SNLF, and other units, currently on Guadalcanal and Tulagi. The majority of Kure 3rd SNLF did not deploy to the Guadalcanal area. Rather it remained at Rabaul from where it participated in the ill fated Milne Bay Operation. There appeared to be substantial numbers of MGs, both 7.7mm and 13mm, available on Tulagi and Gavutu. These were, presumably, AA MGs along with MGs salvaged from Yokohama AG aircraft and the maintenance/armament shops. This may account for the strength of the defense, particularly given the numbers of technically non-combat personnel. Status: offline It may well be a photo of the captured set the US Marines attempted to get into operation in the weeks immediately after their landing. They finally "suspended" these efforts when a SCR-270 was delivered at the end of August. Clearly such sophisticated technology as the "Type 2, Mark 1, Model 1, Mod 0" must have been beyond everyone's understanding at the time as neither side could get any use out of it on Lunga. Status: offline That was the radar set on Lunga Ridge. I believe the metal base is still there today. How many laborers were present ? Status: offline For me, the GAME is more fun with the historic OB in play rather than bogus play balance cheats. If I want balanced opponents, i'll play checkers. Status: offline There are no bogus play balance cheats in AE. Status: offline Put up the evidence or shut up. Status: offline In the case of the 81st being on Guadalcanal in the starting OOB for Scenario 4, it might simply be that the particular sources used for the original scenario research suggested it was there on Aug 7th. I've seen sources in the past that can create a misleading OOB picture. Probably the only person who could really explain why the unit is placed there is the scenario designer. Amongst the base technical personnel on Guadalcanal was at least one radar specialist overseeing the set-up of radar for Guadalcanal. Another is mentioned as performing as similar task for Tulagi. 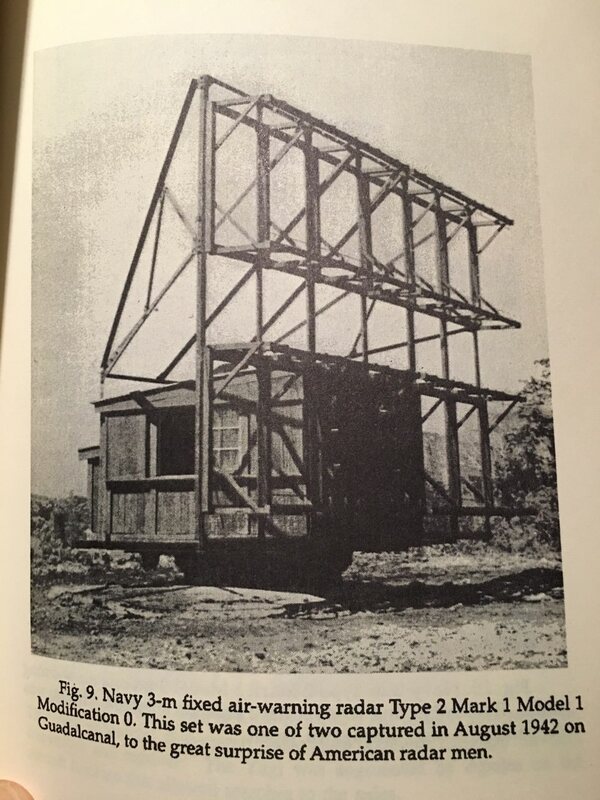 I assume that once these radars were ready, they would have been manned by either locally trained base personnel or ones brought down from Rabaul who had some experience working with the "operational" radar that had already been established on New Britain. You have a terrible sense of timing. I've just ordered the cookies for him. The 85th Communications Unit was responsible for construction and installation of the radar system. 4th Meteorological Unit was responsible for charting air currents for proper orientation of the airfield runway (The 51st Communications Unit had the same responsibilities for radar installation in the Aleutians). The 85th completed the installation and returned to Rabaul 2 August, which is why the system was not operational and did not detect the air activity on the morning of the 7th. The radar system was scheduled to become operational, along with the airfield, on 8 August. Status: offline Dear Alfred and Spence (and others), I did not intend to offend you. If I didn't think WitP-AE was a great game, I wouldn't be spending so much time asking questions about it. I don't think the designers would have provided an Editor if they didn't expect that different users would use and modify the game for different interests. There have been numerous play balance adjustments in this game, "game" being defined by Webster's as an activity engaged in for diversion or amusement. What's the "evidence"? Read through the Forum. I used the word "cheat" to refer to play balance adjustments, not that someone was being dishonest in some way. I don't think the players who post in this Forum look at WitP-AE as JUST a game. The discussions go into great detail on many levels. That interest extends into how the developers may have modified reality and why these modifications were necessary. My personal interest in playing this game is to use it for a simulation (examination of a problem often not subject to direct experimentation by means of a simulating device) after reading one or more books about a topic covered in WitP-AE. I want to include the historical bad decisions in the orders of battle because I want to see how they play out. This is how the real IJN and USN used gaming and war games to model reality before WWII, and incidentally how it's still done in today's military. Now I don't personally think the Japanese Navy needs to be shielded from the effects of their Victory Disease in regards to their lack of a real defense of Guadalcanal and Tulagi. In fact they had spread themselves way too thin at this point by gobbling up weak Allied garrisons all through the South Pacific. The Japanese Army still looked west towards China nd the USSR for additional conquests and left the IJN-sponsored effort to the east and south short on troops. By August 1942 the SNLF had exhausted much of its combat effectiveness and was never particularly robust in manpower. So they leave a major airfield site (Guadalcanal) and seaplane base (Tulagi) exposed to a counterattack they could not conceive of happening. In the event once-elite SNLF troops scurried off into the bush with their Korean laborers on Guadalcanal instead of bleeding the USMC landing force as they did on Tulagi. I will continue to ask questions about units and troops because I want this game to model reality at some level, not because I think the designers and beta-testers are flawed because they find WitP-Ae more diverting or amusing by trying to play balance two opponents who were incredibly mismatched for one reason or another throughout WWII. I get enough great feedback from other players to offset the snarky "it's only a GAME" comments I get from some of the "experts". Status: offline Thanks for this post. This is good info. Status: offline In the episode of "The Pacific" dealing with Battle of the Tenaru (aka Battle of the Ilu River or Battle of Alligator Creek), Marines find a folded U.S. flag in the rucksack of a Japanese soldier. A comment is made that "these must be the guys who took Guam." I don't know if that's just Hollywood dialog or an actual incident. Certainly Ichiki's men had been involved with overrunning several U.S. garrisons. Status: offline Was this radar anti-air or anti-ship oriented? sounds alot like the Pearl Harbor debacle. Status: offline It was an aircraft detection radar. Status: offline As far as I am aware the 28th Infantry Regiment was trained for arctic warfare and had seen some action in Manchukuo. I am not aware of them seeing any action in the Pacific prior to Guadalcanal. In the episode of "The Pacific" dealing with Battle of the Tenaru (aka Battle of the Ilu River or Battle of Alligator Creek), Marines find a folded U.S. flag in the rucksack of a Japanese soldier. A comment is made that "these must be the guys who took Guam." I don't know if that's just Hollywood dialog or an actual incident. Certainly Ichiki's men had been involved with overrunning several U.S. garrisons. If a US flag was found amongst the dead of Ichiki's force, it doesn't seem to have been mentioned in the Marine reports concerning the action. Just prior to Ichiki's assault, it was known from documents captured after Brush's ambush the day before that a sizable IJA unit had just arrived on Guadalcanal from Truk and had surprisingly accurate maps of the main US positions around the airfield. Just a few days after Ichiki's assault, it was known what IJA regiment had been involved, its strength, its leader's name and that the unit had combat experience (in China), had considerable amphibious training and been earmarked for the (aborted) Midway landing, had then gone to Guam (long after it had been captured in Dec '41) and had then sailed for Truk and then onto Guadalcanal. The Marine divisional and regimental records mention the use of captured documents (including diaries) and interrogation of three prisoners as the source of the information. Although the Marines had all the information they needed to build this picture of Ichiki's force in a relatively short time, I'd suggest if they had also found a US flag on the body of one of Ichiki's dead, it should have been unusual enough that you would think someone would have noted it in one of the reports. Doesn't mean it definitely never happened though. Hollywood doesn't make everything up. There are no bogus play balance cheats in AE. What then do you call having Gen Kawaguchi and his 124th Regt/35 Brigade sitting at Tassaforonga on Aug 7th with 100% preparation? Since the Kawaguchi Brigade didn't arrive at all until the end of August/beginning of Sept and the game's systems would likely make it next to impossible for the Japanese to establish a viable beachhead on Guadalcanal (only 2 hexes) if it wasn't there that would seem like a play balance thing to me.